Richard Myers has been producing experimental and documentary films for over 40 years. 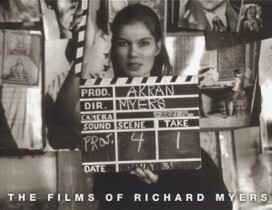 The Films of Richard Myers chronicles these films, along with descriptions and reviews by such film critics as Roger Ebert, Arthur Knight, Roger Greenspun, Kevin Thomas, and Amos Vogel, as well as short reviews by Stan Brakhage and Pauline Kael. The major part of the book consists of 180 photos from the films, all photographed by Myers. With a background in painting, printmaking, and still photography, Myers began making films in the early 1960s when independent experimental films were truly independent. Myers conceived of the ideas, wrote the scripts, photographed, directed, and edited the films. His actors were family and friends, from his wife Pat to his grandmother, mother, and son, to Kent State University faculty and students.